The HyperX Pulsefire Core RGB Gaming Mouse will not break your budget, but offers solid design but not a lot of the extra frills found in higher end gaming mice. The features it does provide however, are all essentials that are generally well implemented. The first thing I took note of is the overall form factor. 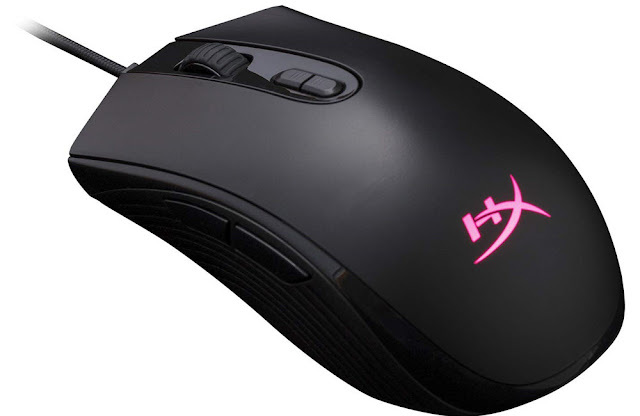 I have had the opportunity to use a couple of different Pulsefire mice from HyperX by now, and the Core is much more like the Surge in that it is a symmetrical design as opposed to ergonomic. The shape of the mouse itself has the flared front that reminds me just a bit of the popular Deathadder mouse by Razer. I know some people do not care for that flare at the front, which is why I call it out, even though I personally do. This is a large mouse that fits my relatively large hand rather nicely. So for me, the form factor is quite comfortable. On top of that, the sides have some texture to it, giving it a nice grippy feeling. That being said, the mouse lacks that rubbery coating that I like and find on higher-end mice that helps it remain comfortable even when I am sweating a bit. The buttons are all laid out in logical, comfortable locations. On some mice the side buttons are a bit further back than I like, but that is not the case here. It is also worth calling out that the scroll wheel feels good and substantial. All of the buttons have a nice clicking feedback sound as well, and I never had any issues with my button presses registering. Also note that this is a wired mouse, and that the cable is braided, which is always my preference. While on the topic of performance, the optical sense performs quite nicely. I did not notice any pixel skipping when it was on a padded surface, though harder and unpadded ones predictably did not track quite as well. Given that I alternate between the arm of my recliner chair and the mousepad on the table next to me, the HyperX Pulsefire Core RGB Gaming Mouse tracked nicely on both surfaces. There are some DPI buttons a bit south of the scroll wheel, and while these cannot be programmed, they do go as high as 6,200. It glides easily enough, though I came away with the impression that this was a bit more of a control mouse than a speed one due to the large skates on the bottom. This is a plug and play mouse, making it quick and easy to get going with. However, greater customisation can be achieved by using the HyperX NGenuity software. This allows configuration of the lighting (which is always a nice perk, even though I will say that the Pulsefire Surge is a flashier device with its ring of RGB lighting around the perimeter). Additionally, the buttons on the mouse can all be programmed as well (though generally speaking, you're only really likely to configure the two side buttons and maybe what the scroll wheel does when it is depressed). There is a good deal to like about the HyperX Pulsefire Core RGB Gaming Mouse, especially at its price point of about forty dollars. It tracks well, and it feels good in my hand even if the design is not going to be for everyone. Using the NGenuity software, you can customise the unit some, but do not expect all of the bells and whistles found on more expensive mice like extra buttons, weights, additional lighting and things like that. However, what you do get with the Pulsefire Core is a solid mouse with nice buttons and a lean towards control over speed in its sensor performance.